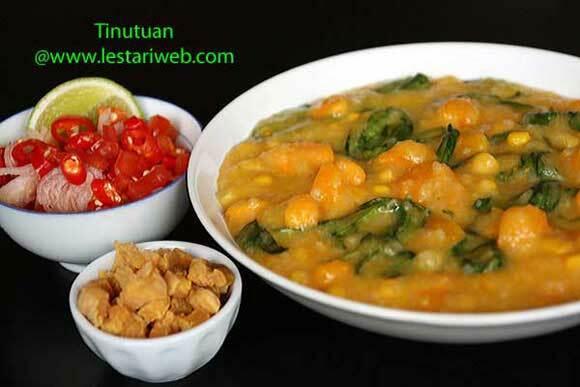 Tinutuan or Bubur Manado or Manadonese Porridge is a rice porridge mixed with various vegetables such as spinach, kangkung, corn, pumpkin and sweet potato or cassava. Tinutuan is from Manado, North Sulawesi, Indonesia. Some people also said that it is from Minahasa, North Sulawesi, Indonesia. Etimology of the word tinutuan is unknown. Also, the exact time when tinutuan found is still unclear. 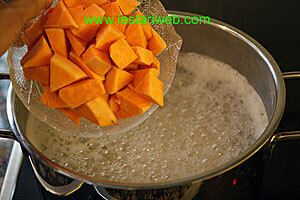 Wash the soaked rice two or three times until your get clear water, set aside to drain. Pour 1.5 liter cold water in a large saucepan. Add lemon grass & ginger and bring to boil. 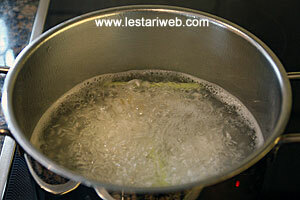 When the water boils, add the rice into the saucepan & cook until the rice is tender. 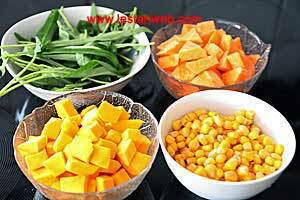 While boiling the rice, prepare all the sliced vegetables. 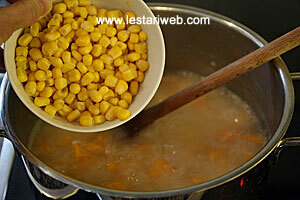 Add the fresh sweet corn if use & salt. Continue to cook for about 10 mins. Stir occasionally. 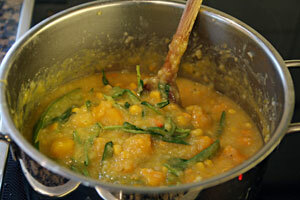 (If you use canned sweet corn add at the end to prevent overcooked, because canned corn is already pre-cooked). 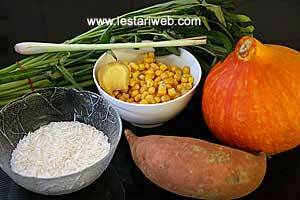 Add the cassava & pumpkin. 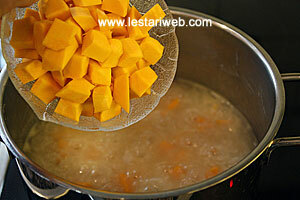 Continue to simmer over medium heat until all ingredients are tender (takes about 20 mins). 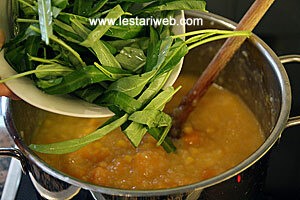 Add the canned corn (if used) & water spinach. Cook briefly until just wilted. Adjust the seasoning, add salt if necessary & remove from heat. Serve with Sambal & garnish with fried salted-fish. You can vary the vegetables as your preference for example long beans. You can also take another sambal from this sites which suits to your taste.